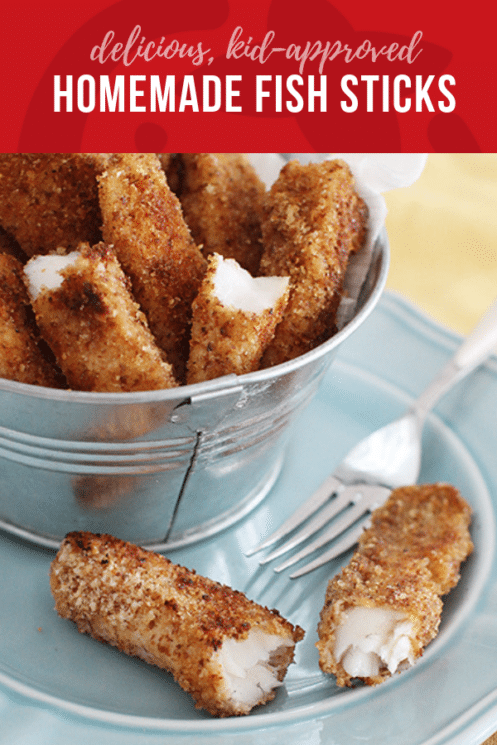 Dish out your favorite dipper, and bite into one of these crunchy homemade fish sticks! 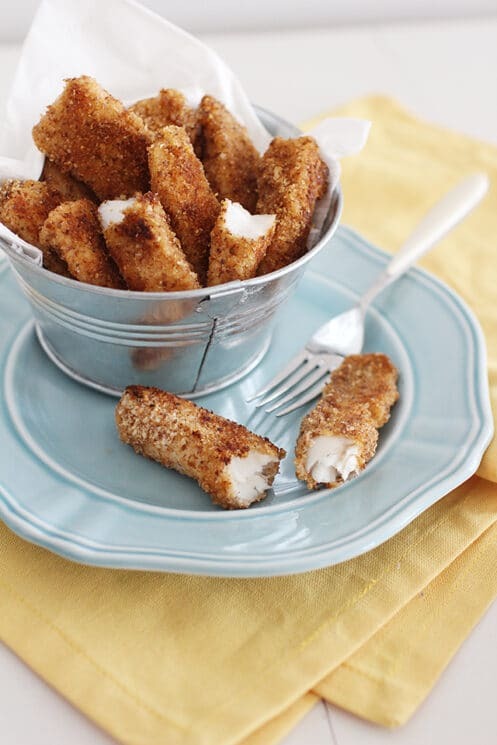 Tender, protein-rich fish sticks are coated with a crispy breading and a surprise ingredient for extra nutrition! Did you know? 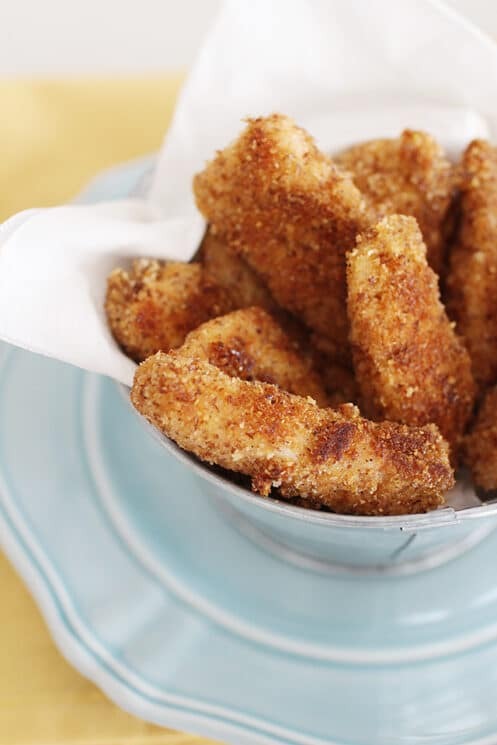 You don’t have to be a bearded man in a yellow poncho to serve up crispy, crunchy, and tender fish sticks! It’s true. If you have 30 minutes and a pound of white fish, you’re well on your way to making this frozen-food classic, right in your own kitchen. Nowadays, you can actually buy decent bakes fish sticks in the freezer aisle. 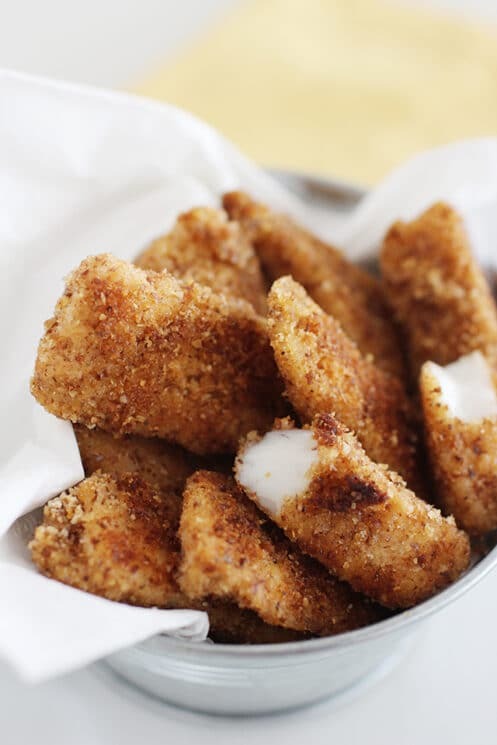 But when you make fish sticks yourself, you’ll have the pleasure of eating the very freshest-tasting fish, the nutrition of homemade breading (power-packed with flaxseeds!) and the pride of serving your kids a from-scratch meal. So let’s add this one to the meal plan, shall we? If your kids need a little enticement to dig into this fish dish, don’t underestimate the power of a good dip. Let them pick a flavor (or two) and watch those fish sticks disappear. Move through your assembly line with each piece of fish (it’s OK to move a couple of fish sticks into each bowl at a time, if it helps you move faster.) 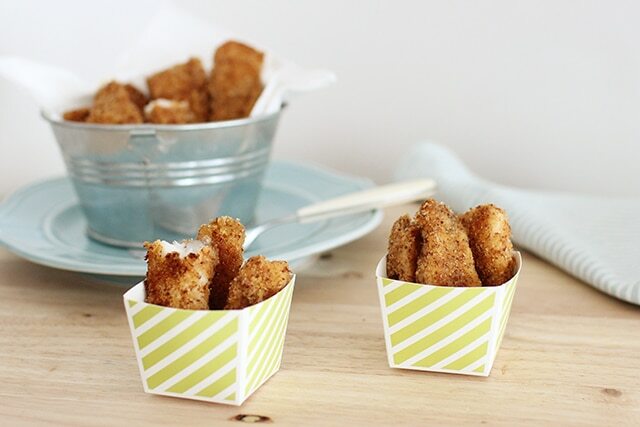 When all the fish sticks are breaded, begin frying them in a skillet lightly coated with avocado oil or olive oil. About four minutes per side gets the breading nice and crispy, and the fish flaky and tender. As soon as they’re done cooking, serve them up! Offer them alongside a steamed veggie and your kids’ favorite dippers, like barbecue, honey-mustard, tartar sauce, or ketchup. Cut fish into strips; set aside. Whisk together eggs and pepper in a shallow dish. In a separate shallow dish, combine the flaxseed, Old Bay Seasoning, salt, breadcrumbs, and Parmesan cheese; blend well. 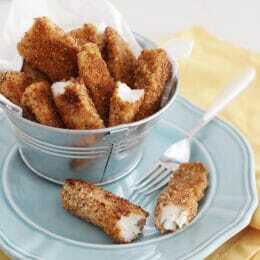 Coat fish sticks in egg wash, allowing excess to fall off fish; then, dip in bread crumb mixture, coating both sides. Place onto a clean dish until ready to cook. Continue until all fish sticks have been coated. Heat 1/8 cup of oil in a large skillet over medium-high. Place half the fish (or less if you are using a smaller skillet) into skillet in a single layer. Cook on each side for 4 minutes, allowing to brown evenly. Set aside and cover to keep warm. Add more oil to the skillet as needed, allowing to reheat before cooking remaining fish sticks.